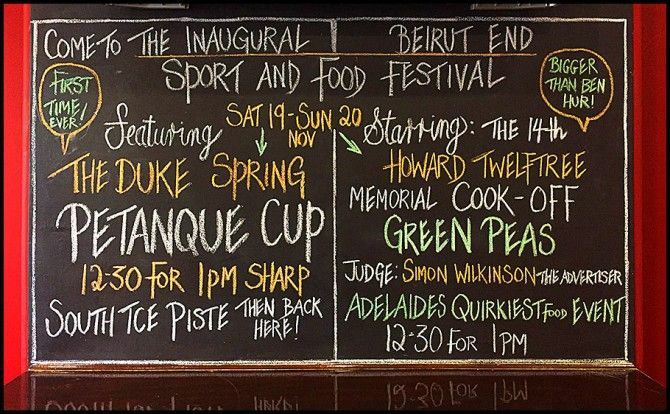 THE BUILD-UP: For the first-ever Beirut End Sport and Food Festival, the message was loud and clear, thanks to the brilliant chalk art of Heather Glynn. 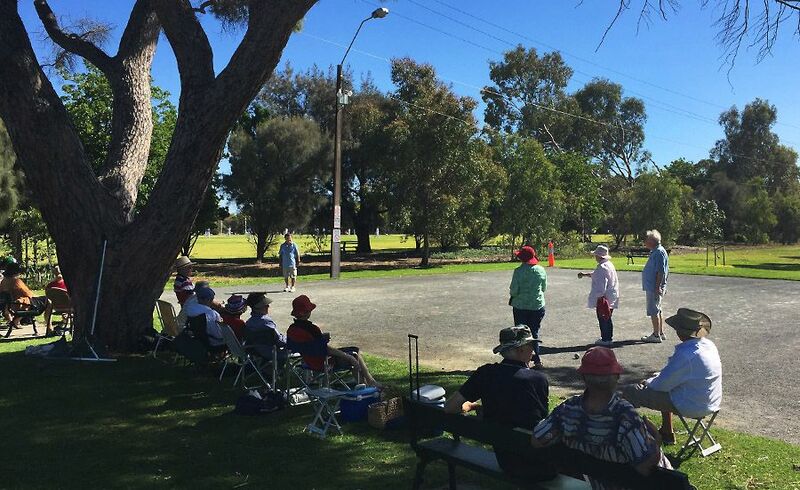 DAY ONE: The piste was in perfect shape, the sky was blue, the company lively – the ultimate Adelaide spring afternoon. 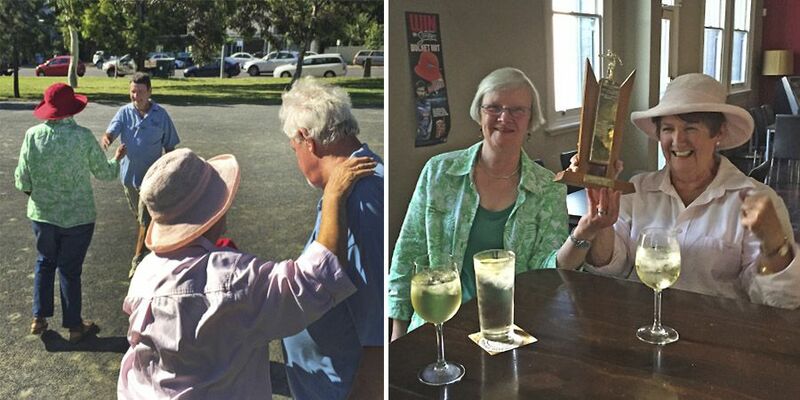 LADIES DAY: The worthy winners were… FAB’s Margie and Dinah, over the Prostate Boys, Derek and Lance. 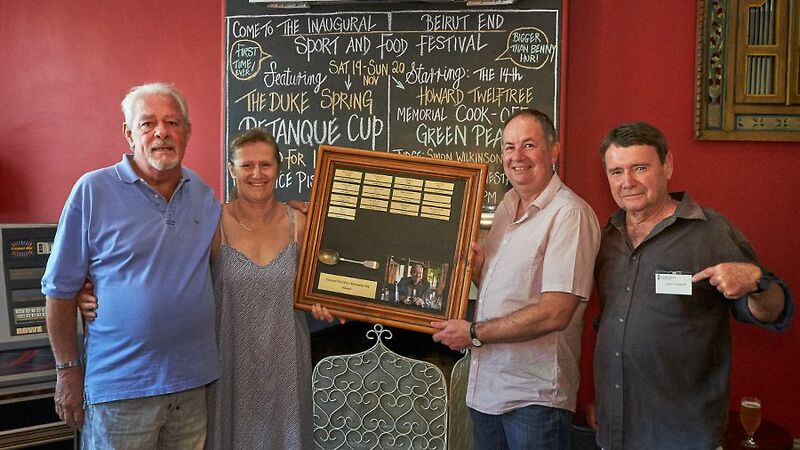 DAY TWO: Back to the Duke with mine hosts Julie and Steve for the Howard Twelftree Memorial Pea-off, Adelaide’s quirkiest food event. Judge Simon Wilkinson, The Advertiser food editor, is warmly welcomed. HARD at work – somebody’s gotta do it. 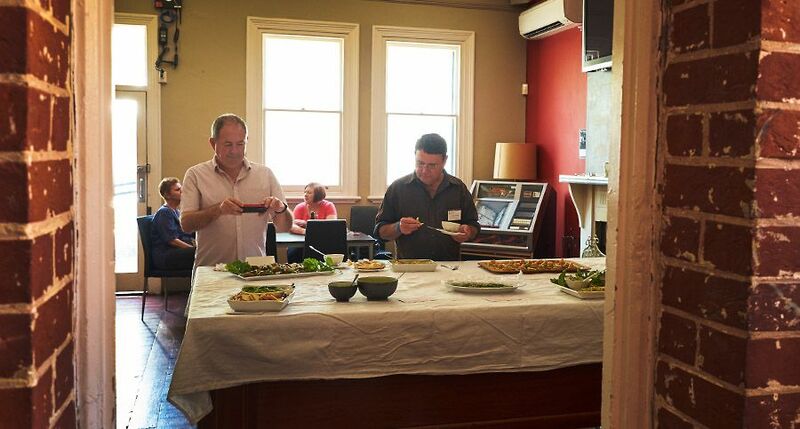 Simon even indulged in the global craze – food photography. THAT makes two in a row. The winner was Cathy Hood again with a the green pea falafel. 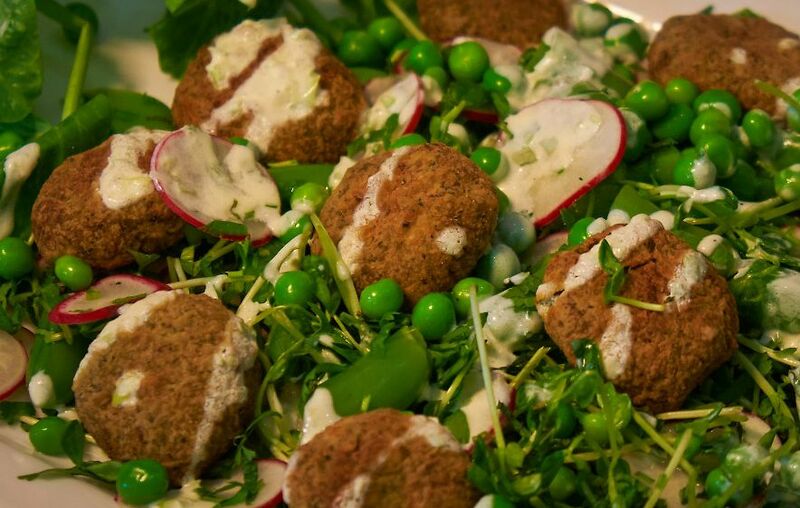 The green pea falafel with a pea & radish salad and butter milk dressing. 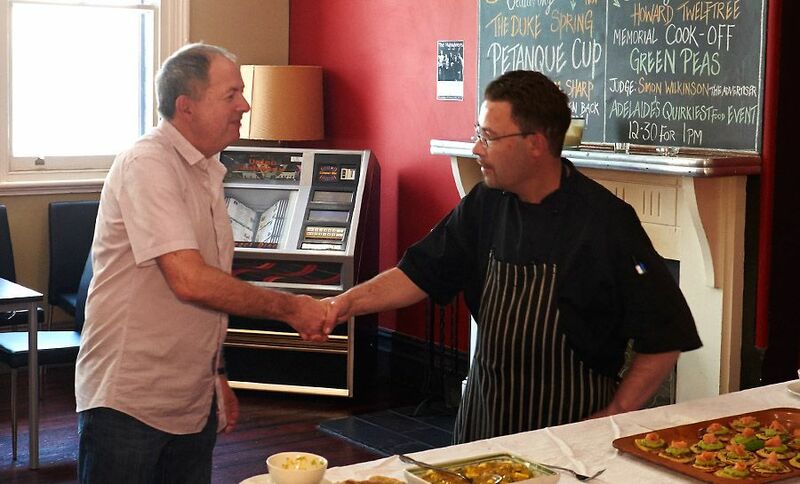 THE Duke’s executive chef Tim Black popped in to make a very handy contact. 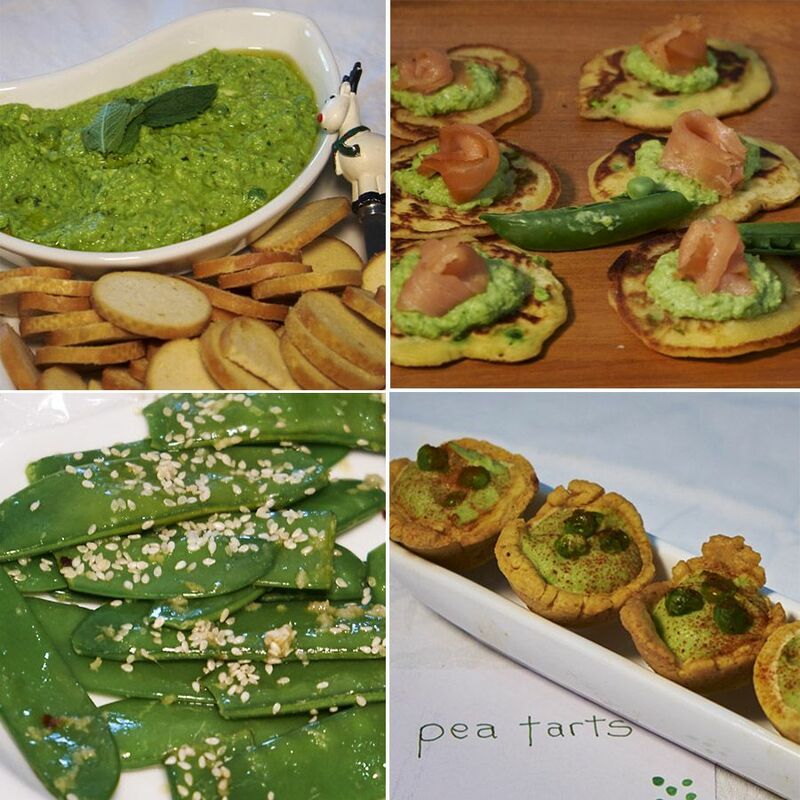 ON the table: Among the entries, the Packing Case Prize went to Lavinia Gent’s pea tart. WINNERS: Derek accepted for Lavina. 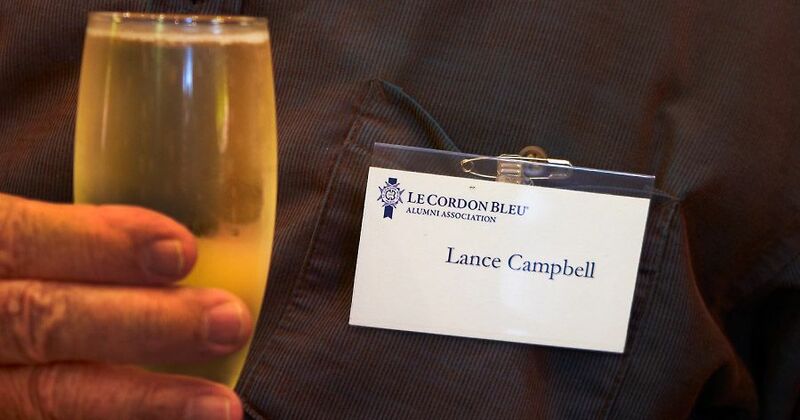 Our new le Cordon Bleu Packing Case judge, and ace reporter. NEXT Cook-off ingredient EGGPLANT, in February. Be there! Cathy Hood’s The Pea Falafel recipe. Toast seeds in dry pan till roasted & grind all but 1 tablespoon cumin seeds. Heat olive oil – I used roast onion flavoured olive oil – and fry onion & garlic till onion is soft. Tip this, along with the rest of the ingredients, into a food processor, and process until everything is well blended and a smooth paste is achieved. Season well. Chill for at least a couple of hours, or until mix has firmed up, and shape into patties. Dust in flour and fry in canola oil till falafel has turned a golden colour. The salad is a mix of snow pea sprouts, sugar snap peas, fresh peas , sliced radishes, chopped mint and chopped coriander. The dressing consists of 2 -3 tablespoons buttermilk, approx. ¼ cup sour cream, 1 finely chopped spring onion, 2-3 tablespoons onion flavoured olive oil and seasoning. Whisk or blend all ingredients together. Robert Carrier’s book “Making the most of vegetables”. 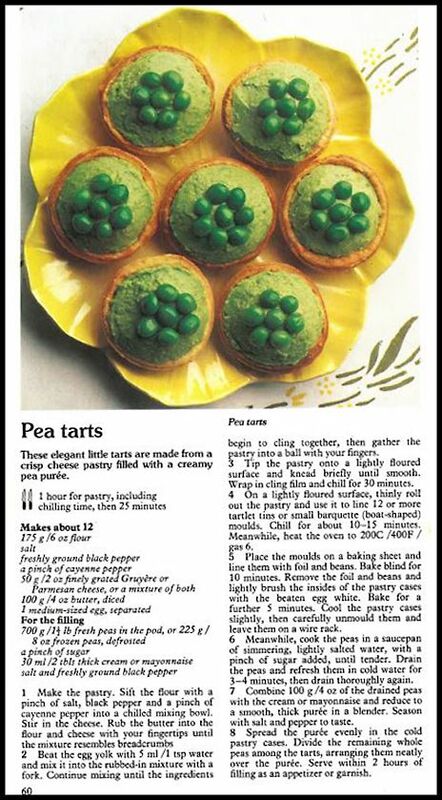 Robert Carriers recipe for Pea tarts.